One of Funter Bay’s resident fishermen in the 1930s and ’40s was a fellow nicknamed “Screaming Jack” Lee. Apparently this colorful nickname was earned by frequent anger and a habit of yelling at whatever chore he was performing. Even “Jack” was a nickname, at the time a common informal version of the more formal “John” (something I find a bit odd). As mentioned in a previous post, Screaming Jack became so notorious that he even got a brief mention in National Geographic. “Jack” was the oldest son of a South Dakota farming family, born March 7 1883* as Irven Lee. His siblings were William (b. 1885). Stella (1887), Gertrude (1889), Howard (1891), Albin (1894), and Ella (1898). Jack’s father Thomas Lee was born in Michigan in 1852 and homesteaded a farm near Claremont, SD. His mother Mary Ann (Ruddy) Lee, also from Michigan, was born in 1859. Both parents were the children of Irish immigrants. (*The birth date of 1883 is one of several which appears in government records, ranging from 1880-1885). Between 1900 and 1910, young Irven Lee changed his name to the more American-sounding John Irwin Lee, and left the family farm for Seattle. He entered the army in his 20s and re-enlisted several times. In 1910 Lee served at Fort Worden near Port Townsend, WA. He re-enlisted in 1912 at Seattle’s Fort Lawton, giving his occupation as “Engineer”. He served in the Coast Artillery on defensive gun positions in the Puget Sound area. He received an Honorable Discharge on February 9, 1915, but was back in the army by August of 1917, this time in the new Aviation Section. He rose to the rank of Corporal with the 133d Aero Squad, a supply squadron training at Kelly Field in Texas. Lee was promoted to Sergeant in October of 1917, but his military career seems to have run into trouble soon afterward. He appears to have been busted down to Private and transferred to the new 327th Aero Squadron, also at Kelly Field. Less than a week later he was sent to the Springfield Arsenal in Massachusetts for a training class. A note from November of 1917 mentions a Private John I. Lee from Camp Kelly being sent to the Marlin-Rockwell Gun Corp in Connecticut for a 4-week instruction course. From January 22 of 1918 until discharge, Lee is listed as “AS” (Air Service) with no details as to unit or location. He rose back as far as Private 1st class by November of 1918, then left the army with an Honorable Discharge in January of 1919. In 1920, Lee was working as a mechanic in the Vallejo, CA Naval Yard (Mare Island on San Francisco Bay). His name and birth year are not fully or correctly recorded in the 1920 census, but other information (parents and birth day/month) does match. I could find no identifiable match for 1930 or 1940 census records. If he were fishing during those decades he could have easily been missed by census takers. According to some of his acquaintances, “Jack” Lee began fishing in the Funter Bay area in 1932. He reportedly hand trolled for salmon, likely using a small open boat that could easily be beached for the night. As with many hand trollers of the time, Lee seemed to have something of a nomadic lifestyle with no fixed home or base of operations. Local residents reported that he camped in a variety of locations, including a cabin in Hawk Inlet and a cabin South of Funter Bay at what later became Gunner Ohman’s fish camp. He apparently also built the “Jack Lee Trail”, perhaps from one of his camps to somewhere he could pick up mail and supplies. Lee’s next brush with military service came in 1942, during registration for the “Old Man’s Draft”. Listing his age as 62 with an earlier birth year may have been an honest mistake, or an attempt to make himself less desirable for government service. Lee was living in Funter Bay at the time and gave his occupation as “Fisherman”. He registered with Harold Hargrave, Funter’s postmaster and draft registrar for the White population of the area. Hargrave is also listed as the “Person who will always know your address”. I am not sure when the “Screaming Jack” nickname came about, but neighbors reported that he could often be heard yelling at his tools or his firewood from across the bay. According to the 1947 National Geographic article, he was “Always mad”. “I found Mr. Jack Irwin Lee dead in bed in his cabin at Funter Bay on Feb. 20, 1950 apparently died on Feb. 19 from causes unknown to me”. “Other conditions” of the deceased are given as “Probably Tuberculosis & Senility”. His occupation is given as Fisherman and Fur Trapper, and he is listed as a WWI Veteran. He was buried in Juneau on Feb 28, 1950. US Census records, various years. National Archives. WWII “Old Man’s Draft” Registration Cards, Selective Service Registration Cards, World War II: Fourth Registration Fold3 / National Archives. 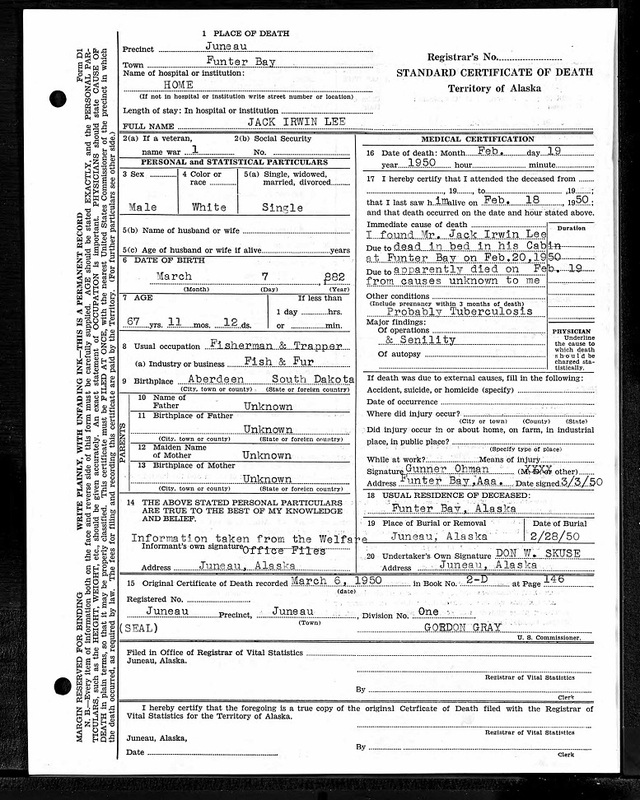 Jack Irwin Lee, “Standard Certificate of Death”, Territory of Alaska, recorded March 6, 1950. This entry was posted on Wednesday, August 30th, 2017 at 11:49 am and is filed under Alaska History, Funter Bay History, Funter Bay People. You can follow any responses to this entry through the RSS 2.0 feed. You can leave a response, or trackback from your own site.